Anytime is the perfect time to indulge on St. George Island property. Residents spend plenty of time soaking up the scenery and savoring the tastiness of frosty treats from Aunt Ebby’s Ice Cream. Traditional cones compliment any type of weather and are sure to bring a smile or two. Known for the “biggest scoops on the beach and the friendliest service in town” Aunt Ebby’s is the place to go to spoil yourself or someone else. Located at 147 East Gulf Beach Drive, the colorful decor welcomes one in. Lively tunes fill the St. George Island property keeping the mood energetic. Helpings are piled high and tower over with deliciousness. There’s no scrimping here. Crisp cake cones mix perfectly with creamy smooth scoops. Waffle cones are weaved with sweetness. Flavors are plentiful, fanciful, traditional and whimsical. The classics are well represented with chocolate, vanilla and strawberry. Rave reviews stack up for banana pudding. Celebrate any old day with birthday cake. Butterfinger pairs perfectly with candy loving indulgers. Mocha almond fudge, pistachio almond and pecan praline cause lines to form. Many enjoy their scrumptious dessert out on the patio overlooking views of the Gulf of Mexico and the lighthouse. Having been a locally run and favorite business for over twenty years families visiting St. George Island real estate make Aunt Ebby’s an annual stop. Those preferring options other than cones shall not be disappointed. Shakes are thick and rich and sundaes overflows with nuts, whipped cream, gummies and sprinkles. 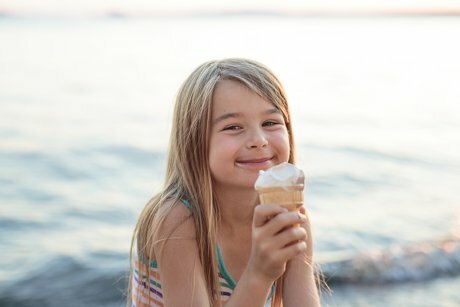 Aunt Ebby’s Ice Cream is the perfect destination to end a day kayaking the waters or hiking and biking the trails. Doors are open afternoons and evenings from 1 to 8 p.m. Hours are seasonal and may change periodically. After one bite kids of all ages will beg for more and one trip in guarantees a return visit.